In a landmark speech, Warren proposes a progressive politics that protects black people from violence, ensures access to the ballot box, and builds economic opportunity. Elizabeth Warren is not the leader of the Democratic Party in any formal sense. She is not the 2016 presidential nominee, nor even a contender for the spot—at least for now. She is not the head of the party’s caucus in the Senate. She does not even chair a key committee. Yet, she is setting the course for the party as it approaches the 2016 election. She is focusing its agenda and exciting its base at a point when the question of leadership is a critical one for Democrats who are in the process of selecting a nominee, choosing new congressional leaders and framing an agenda for post-Obama era. That was evidence over the weekend as she delivered a striking speech on racial justice and hit the campaign trail for an old ally who hopes to join “the Elizabeth Warren caucus” in the next Senate. The speech on racial justice was presented as a part of the Edward M. Kennedy Institute for the United States Senate’s “Getting to the Point” series. And Warren did, indeed, get to the point. Fifty years later, we have made real progress toward creating the conditions of freedom—but we have not made ENOUGH progress. Fifty years later, violence against African Americans has not disappeared. Consider law enforcement. The vast majority of police officers sign up so they can protect their communities. They are part of an honorable profession that takes risks every day to keep us safe. We know that. But we also know—and say—the names of those whose lives have been treated with callous indifference. Sandra Bland. Freddie Gray. Michael Brown. We’ve seen sickening videos of unarmed, black Americans cut down by bullets, choked to death while gasping for air—their lives ended by those who are sworn to protect them. Peaceful, unarmed protesters have been beaten. Journalists have been jailed. And, in some cities, white vigilantes with weapons freely walk the streets. And it’s not just about law enforcement either. Just look to the terrorism this summer at Emanuel AME Church. We must be honest: Fifty years after John Kennedy and Martin Luther King, Jr. spoke out, violence against African Americans has not disappeared. And what about voting rights? Two years ago, five conservative justices on the Supreme Court gutted the Voting Rights Act, opening the floodgates ever wider for measures designed to suppress minority voting. Today, the specific tools of oppression have changed-voter ID laws, racial gerrymandering, and mass disfranchisement through a criminal justice system that disproportionately incarcerates black citizens. The tools have changed, but black voters are still deliberately cut out of the political process. But then, Republicans’ trickle-down economic theory arrived. Just as this country was taking the first steps toward economic justice, the Republicans pushed a theory that meant helping the richest people and the most powerful corporations get richer and more powerful. I’ll just do one statistic on this: From 1980 to 2012, GDP continued to rise, but how much of the income growth went to the 90% of America—everyone outside the top 10%—black, white, Latino? None. Zero. Nothing. 100% of all the new income produced in this country over the past 30 years has gone to the top ten percent. Today, 90 percent of Americans see no real wage growth. For African-Americans, who were so far behind earlier in the 20th Century, this means that since the 1980s they have been hit particularly hard. In January of this year, African-American unemployment was 10.3 percent—more than twice the rate of white unemployment. And, after beginning to make progress during the civil rights era to close the wealth gap between black and white families, in the 1980s the wealth gap exploded, so that from 1984 to 2009, the wealth gap between black and white families tripled. 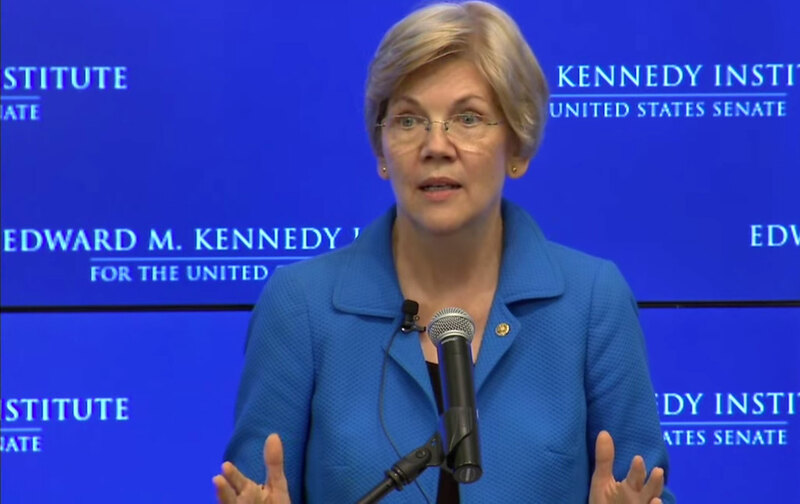 Warren’s speech is an essential statement for a party in search of itself. Others have touched on many of the same themes. But the senator is weaving them together, building bridges and making connections that the Democratic Party must make. She recognizes and embraces new demands, while integrating them with historical memory. In many senses, she has given the party its marching orders. Yet Warren is not simply framing a fresh and focused political agenda. She is putting it into practice, traveling the country—on a separate track from the presidential race, often with little notice—on behalf of Senate candidates who she believes will be essential players in the next Congress. On Saturday, she was in Madison, Wisconsin, with former US senator Russ Feingold, with whom she worked almost two decades ago in fights against credit-card companies and banks. Feingold, who shares Warren’s economic populist vision and her deep commitment to racial justice (having aligned more than a decade ago with Michigan Congressman John Conyers to develop national legislation dealing with police profiling and practices), is running again for the Senate and weaving together issues in a way similar to the senator from Massachusetts. That’s given Feingold a leading position in most polls, but he faces a millionaire opponent (Republican incumbent Ron Johnson) with billionaire backers (such as brothers Charles and David Koch). Warren fired up hundreds of young people on the University of Wisconsin campus with specific advocacy for student-debt relief, labor rights and economic and racial justice—as well as a broader call for a new politics that puts voters ahead of campaign donors.